Accepted ecological theory says that poor soils limit the productivity of tropical forests, but adding nutrients as fertilizer rarely increases tree growth, suggesting that productivity is not limited by nutrients after all. 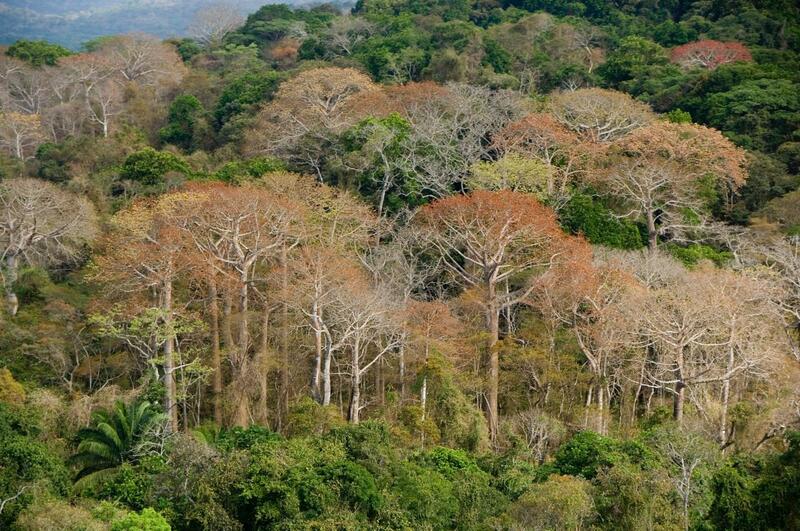 Researchers at the Smithsonian Tropical Research Institute (STRI) resolved this apparent contradiction, showing that phosphorus limits the growth of individual tree species but not entire forest communities. Their results, published online in Nature, March 8, have sweeping implications for understanding forest growth and change. Vast areas of the tropics occur on old landscapes where rock-derived nutrients have been leached away by years of heavy rainfall. Phosphorus is particularly scarce, because the iron oxides that give tropical soils their characteristic red color bind to the phosphorus, making it unavailable to plants. However, the addition of fertilizer to diverse forests in Africa, Southeast Asia and the Americas has not increased tree growth. The only place where fertilization resulted in increased tree growth was in Hawaii, where the forest is dominated by a single tree species. An alternative way to study nutrient limitation is by comparing the growth rates of trees in forests that naturally differ in soil nutrient availability: the tiny but highly biodiverse tropical country of Panama provides a perfect setting for this. The complex geology of central Panama means that natural levels of plant-available phosphorus in the soil vary more than 300-fold–similar to the range of phosphate availability in tropical soils around the world. And because the soils in Panama also vary in moisture and other nutrients such as nitrogen, calcium and potassium, researchers can study the effects of these variables on growth at the same time. To examine the effect of phosphorus on tree growth, researchers measured 19,000 individual trees in 541 different tree species in a series of long-term forest monitoring plots that are part of the Forest Global Earth Observatory (Smithsonian ForestGEO) network managed by the Center for Tropical Forest Science at STRI. On average, growth rates of individual tree species increased in soils with higher levels of plant-available phosphorus, consistent with ecological theory. Surprisingly, however, tree species that occurred on low phosphorus soils grew faster, on average, than species growing on high phosphorus soils. And in a final twist, variation in the tree species present across plots meant that community-wide growth rates did not change according to the level of soil phosphorus. "Finding that species adapted to low phosphorus soils are growing so fast was a real surprise," said Ben Turner, STRI staff scientist, who led the study. "We still don't understand why this occurs, nor why high phosphorus species are not growing faster than they are. Perhaps trees invest extra phosphorus in reproduction rather than growth, for example, because seeds, fruits and pollen are rich in phosphorus. For now, these results help us to understand how soil fertility influences tree growth in tropical forests, and demonstrate once again the power of tropical diversity to surprise us." "This study highlights our limited understanding of how plants cope with phosphorus-poor soils, a significant challenge to farmers through much of the tropics," said Jim Dalling, STRI research associate and professor and head of the Department of Plant Biology at the University of Illinois Urbana-Champaign. "Comparing how plants adapted to high versus low phosphorus availability acquire and use this critical nutrient could suggest new approaches for increasing food production without relying on costly fertilizers."